- Slaton Racing’s Vince Friese, whose moonlighted in 450SX before and after his 250SX East Region campaign, was back on the 450 in Seattle. Known more for his on-track incidents in the past than his results, Friese has begun to change that rep in 2013, as he’s keeping relatively clean on-track, while putting in good results in both classes. Friese ran inside the top ten the majority of his first race back on the 450, before fading back to eleventh, still his second-best career 450SX finish. 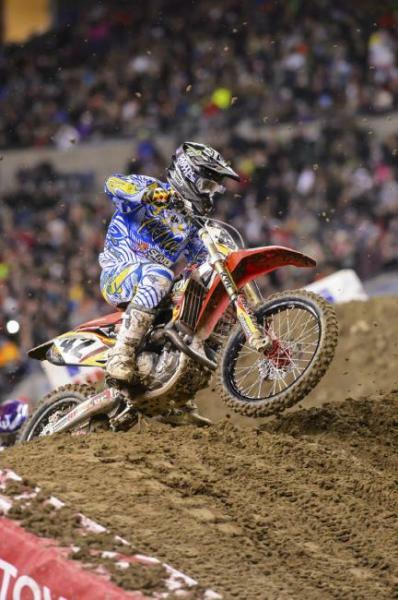 Friese was also a consistent top-five threat in the 250SX East Region. - Congrats to privateer Cody Gilmore and local boy Michael Horban (Oregon) on making their first 450SX mains of the season. Aaron Hansel caught up with Gilmore after the race to talk. Check it out HERE. - Following a rough start to his 450SX campaign, N-Fab/TiLUBE Yamaha’s Phil Nicoletti has been nothing short of remarkable as of late. At the beginning of the season, Nicoletti wasn’t even making 450 main events, but once he made his first, he’s made every one since (seven-straight). Now the New Yorker has been slowly creeping toward his first career 450 SX top ten, with shots to achieve the feat in Houston and Minneapolis. 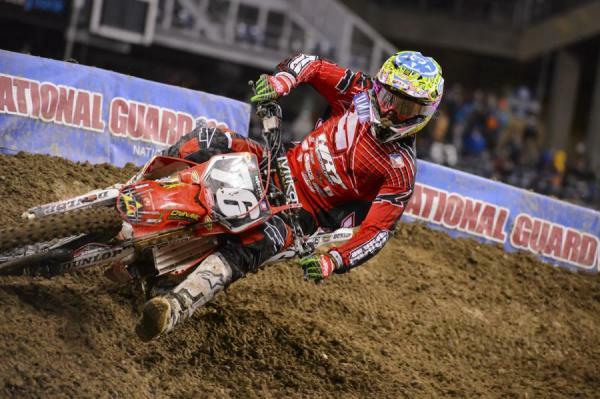 The determined Nicoletti finally secured that top ten in Seattle. Racer X’s Jordan Roberts caught up to him after the race. Vince Friese was back on the 450 in Seattle. - Although Bobby Kiniry failed to make the main, the team still had a good night with Nicoletti’s result, and Chris Blose putting together a season high 14th. - Dodge/Sycuan/RCH Suzuki’s Broc Tickle is on the same course he was a year ago, where he started slow then gradually started to gain steam down the stretch. Tickle is fond of the Seattle terrain, as he picked up his first career Lites win here, and it showed as he rode to a season-high seventh this weekend. Even in an injury-ravaged field last year, Tickle was only able to card a season-best of sixth. - SECOND PLACE: Worst finish this season for 250 West points leader, Red Bull KTM’s Ken Roczen in 2013. Talk about consistency! - It’s been a trying year for Monster Energy/Pro Circuit Kawasaki to say the least. Injuries and under-performance have played a major part. But things finally looked to turn around for Tyla Rattray in Seattle as he rode to a season high fifth in the Emerald City. - 51 Fifty Energy Honda’s Scott Champion made his third main of the season, and his first since A3, in Seattle. He finised 16th on the night. - Rock River Racing’s Ben LaMay is quietly having himself a pretty good year in supercross and in Seattle he recorded a career-best of thirteenth place. With just a couple rounds left in the season, LaMay is starting to put together some momentum for the Lucas Oil Motocross Championship, which is his better skillset. We’re hearing Yamaha is supplying him with a factory bike (which he'll be riding out of the Rock River pits) for the summer, which could help LaMay complement his best ever supercross season with his best season outdoors. 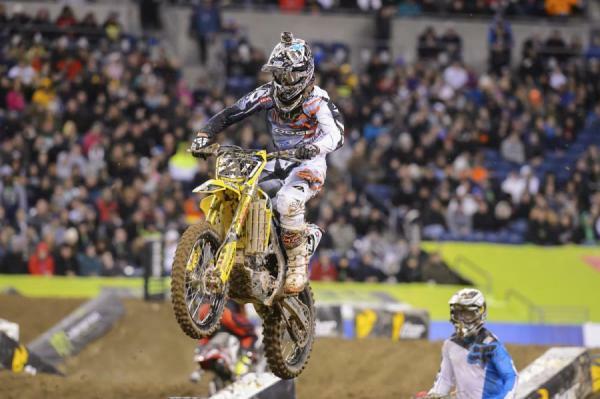 Broc Tickle scored a season high seventh in Seattle. - Even in perfect conditions finding the right setup can be tricky. In Seattle, it was near impossible, as the teams and riders were dealing with varying conditions all day. Free practice was cut from the schedule to give the track crew more time to get the track in shape, the first practice was dry, the second was a soupy mess and by the time the night program rolled around the track had started get tacky in places! To compound matters, teams had to decide whether or not they were going to gamble on the rain coming back, as it was a threat all evening. - After the race we asked Justin Barcia how many holeshots he’s pulled this year, and his answer was “two.” (The entire interview can be read in this week’s Monday Conversation) The first one came in Phoenix, where he led wire to wire, and the second came over the weekend in Seattle, where he repeated the feat. He also said that the team made some adjustments that he believes will deliver him better starts (they tamed down the power delivery so he could keep the front end down). With a win for every holeshot this year, Barcia has proven he’s dangerous with a lead. If the changes made to Barcia’s bike do indeed result in more holeshots, things could get interesting in Salt Lake City and Las Vegas. - Even though he didn’t end up on the podium, Cole Seely had himself a fantastic race in Seattle. After getting a horrible start, the Lucas Oil Troy Lee Honda rider rounded the first lap in eleventh place. Undaunted, he put his head down and proceeded to rip through the pack. By race’s end, he had caught all the way up to Zach Osborne in third place, who was catching Eli Tomac, who was recovering from a crash in second. Had there been another lap, Seely may have had third, or even second! Great ride from Austin Politelli in Seattle. - In keeping with tradition, Seattle was no good for Chad Reed, who DNF’d after getting caught up in a first-turn pileup. Earlier this week, Reed tweeted the following about his lousy luck in Seattle: “Seattle hasn't been kind over the yrs 05 crash 07 crash 08 crash 09 crash 10 crash 11 crash 13 crash..WTF!? 06 I think is only time no crash.” Worse, a majority of those Reed/Seattle crashes have been of the first-turn variety. Reed was a little banged up after the race, but he’ll still be racing in Salt Lake City. - Great ride from HRT Honda’s Austin Politelli in Seattle. The SoCal kid recovered from a fourteenth place start to climb through a deep field en route to a sixth. With that finish, Politelli has reached top ten in points, as he’s currently in tenth.